World 5- Castle is the eleventh course of World 5 in Puzzle & Dragons: Super Mario Bros. Edition. 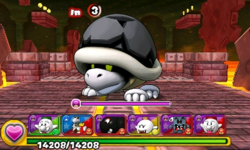 It is a castle level with enemies consisting of Thwomps, Dry Bones, Bone Piranha Plants, Bony Beetles, Big Bony Beetles, Big Thwomps, and a boss fight with Iggy Koopa. 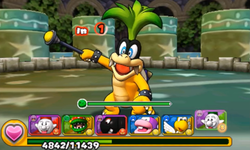 This level is straightforward, consisting of six battles (the sixth battle having a Boomerang Bro and a Hammer Bro) and Iggy Koopa for the boss fight (if the player already has Iggy as an ally by clearing ★World 5- , they fight Flutter & Flame Chomp instead). The player has all five elemental Orb types on the Orb field, while Heart Orbs are disabled. Iggy, the boss of World 5- Castle. ★World 5- Castle is a difficult version of World 5- Castle from ★World 5. The enemy formations for the fourth and fifth battles have switched. The Orb configuration for this Special World course matches that of its normal world counterpart. 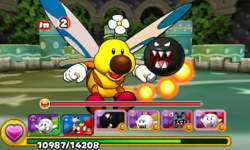 "Flutter & Flame Chomp", replacing Iggy as the boss of World 5- Castle. This page was last edited on January 9, 2018, at 13:52.